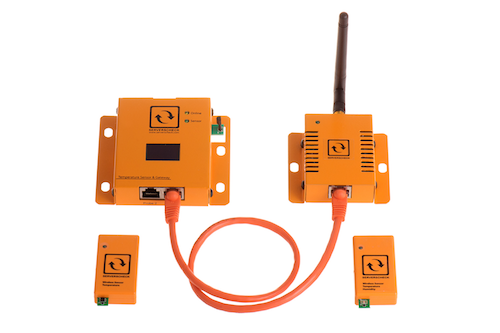 Wireless sensors for indoor and rack monitoring of data centers & server rooms. - Zigbee wireless protocol 2.4 Ghz. 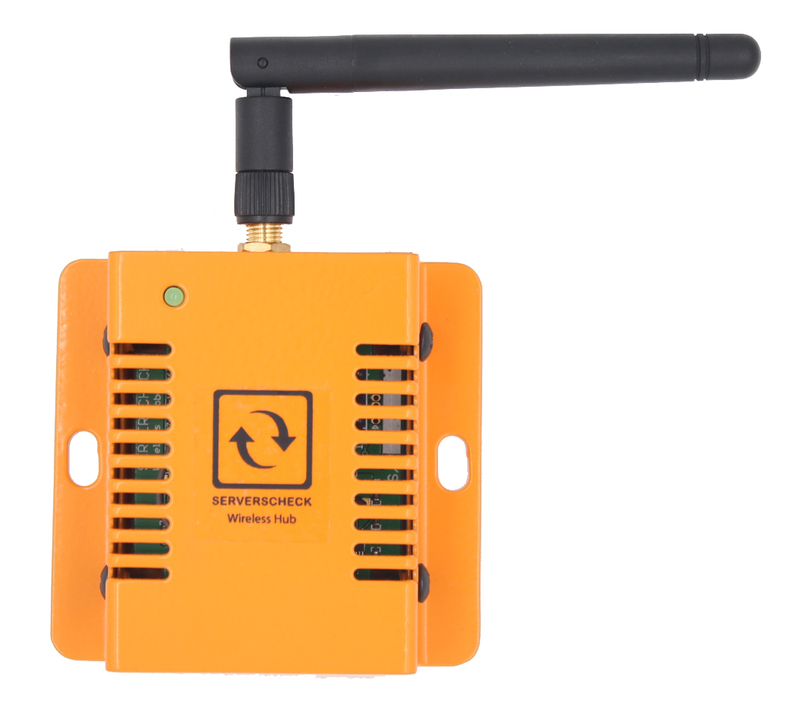 - 128 bit encrypted wireless communication. - max range is 20m line of sight with high gain antenna. - user replaceable 1 year battery life. - temperature only or temperature & humidity sensor. 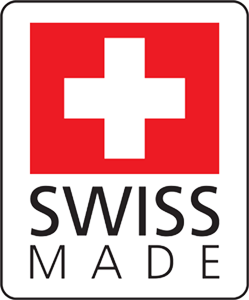 - Swiss made humidity probe. - requires the wireless hub (EXP-WHUB) and base unit. - up to 15 wireless temp & humidity sensors per wireless hub. - up to 30 wireless temperature sensors per wireless hub. not recommended in environments operating 2.4Ghz Wifi due to possible radio interference between low power Zigbee and high power Wifi. In such environments only the 5Ghz band should be used for Wifi. the standard coin battery (CR2450) can be easily replaced. 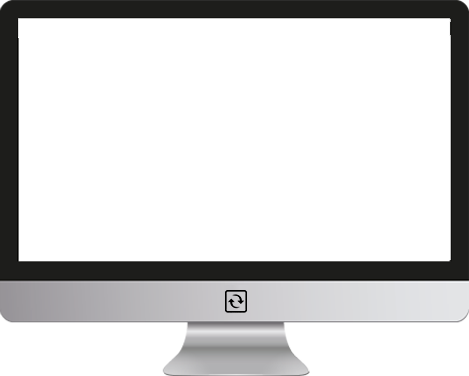 battery status is indicated in the SensorGateway. Compared to RF, Zigbee coexists better with other wireless technologies. It has demonstrated a super tolerance to extreme interference, has a better reliability. The Zigbee sensors communicate using 128bit AES encryption. External temperature & humidity sensor. the sensors report temperature, humidity and dew point. for higher accuracy, the temperature & humidity sensor is mounted outside the sensor. The humidity sensor component inside the ServersCheck sensor is made in Switzerland. It is factory calibrated against several national standards. Final assembly and testing is done in Thailand unless the TAA version is chosen. only one IP address needed for the base unit to which the wireless hub. The wireless hub supports up to 15 temperature & humidity sensors or 30 temperature sensors. the sensors come with a magnetic and double sided adhesives to easily mount them on any support. Temperature Resolution: 0.1°C (0.18)°F precision. Temperature Accuracy: +/- 0.5ºC (+/- 0.9 ºF) over 0ºC to +60ºC. Readings in Celsius or Fahrenheit. Relative Humidity Measurement Range: 0 to 100 % RH. Relative Humidity Resolution or precision: 0.1 % RH and 1 % RH. Relative Humidity Accuracy: +/- 2 % RH between 10 % RH to 90 % RH and +/- 4 % RH below 10 % RH and above 90 % RH. Relative Humidity Long Term Stability: < 1 % RH/year. Battery life time: 1 year. Battery type: coin - CR2450 (not included). Data update frequency: Every 3 minutes. Up to 15 wireless temperature & humidity sensors per wireless hub supported. Maxmimum distance to Wireless Hub: 10m or 30ft with direct line of sight. Certified SensorGateway operating temperature range: 0ºC to +60ºC (32ºF to +140ºF). 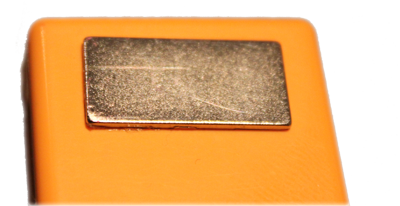 Dimensions: 55 mm (2.1") x 30 mm (1.1") x 13 mm (0.5"). Housing: Orange plastic case with status led. The industry standard set by ASHRAE is to monitor each rack's environment with 6 temperature and 1 humidity sensor. Data Center operators face 2 key issues when monitoring temperature at a rack level using the ASHRAE standards: cabling and IP addresses. Traditional wired sensors are not an option: they require cabling and IP addresses. Wireless technology enables to overcome those issues: no cabling required and one IP address for many sensors. This sensors can monitor 2 metrics: temperature and humidity. For humidity, 1 temperature and humidity sensor per rack is required when following the ASHRAE standard. Humidity should be kept within a 40-60% rH is critical to safeguard the hardware in the racks. ASHRAE recommends 6 temperature sensors per rack: 3 in the front of the rack and 3 at the back of the rack. The front of the rack monitors the intake temperature, the back of the rack the outtake temperature. The delta between intake and outtake temperature should never exceed 20C/35F. For temperature only, the wireless temperature sensors can be used. The sensors communicate over AES encrypted Zigbee protocol (2.4 Ghz) with the wireless hub that connects to the base unit. A wireless hub can accomodate up to 15 temperature+humidity sensors or up to 30 temperature only sensors. The sensors have to be in a 10m/30ft line a sight range of the wireless hub. For easy installation in a rack, the sensors have a magnet at the back allowing them to snap into the rack. The sensors are powered using a coin battery (not included) and have a 1 year battery life span.